From the wedding dress to the shoes, each Indian bridal accessories need to be highly special and should blend with the other accessories. 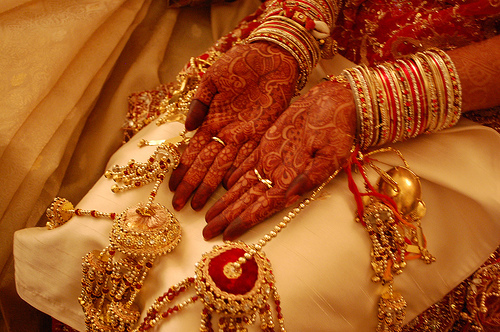 She has to choose a thing carefully by keeping in mind not only look but also comfort.Jewelry,Mehendi,hand bag etc are important part of makeup of bridal.A beautiful color combination elevates the whole bridal appearance and when all the accessories are in accordance with each other, the result is obviously a complete beautiful look. Thick wavy course hairs require ample conditioning for a perfect look. It is not a tension anymore to carry wavy and course hair in accordance with dress and style. A little advice on this regard helps a lot to run with your mood. Starting from the basic groundwork, frequent moisturizing of thick course hair spells magic. Either you have to get ready for work or the occasion is of a fest, it gives you a manageable and stylish hair. Shampoos which promise voluminous and conditioned hair emerge as the best option. It really gives a tempting look. 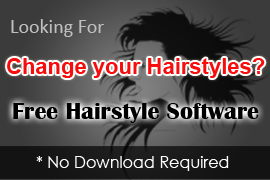 It goes with your various moods and fashion when you carry your wavy course hair long and free on your back. Read More..
Indian brides generally go for buns which are voluminous and beautifully shaped. It is again enhanced with flowers and certain jewels. All the hair is gathered and twisted that forms a bun. It is a traditional method of making hair bun but on occasions, like wedding, it is in perfect harmony with the weddig dress like sarees and lehengas. You can also go for pinned up hair by taking small quantity of hair and pinning them on the head that looks like a bun. Read More.. The hair cutting courses in India are. One can locate these courses in the top cities of the country. Delhi, Mumbai, Bangalore, and so on are the hub of hair cutting courses in India. For instance, there is Elle Passion Professional Hair Academy OF Faridabad which is affiliated with prestigious City and Guilds, London. Not only this, these courses are validated by Schwarzkopf Professional Germany. The graduate course that is offered by this academy is of 36 weeks. Students from different quarters of India and abroad get place in this academy. Read More.. When it comes to South Indian Brides, her hairstyle is of utmost importance. South Indian Bridal Hairstyles mainly consist of very long hair as keeping the hair long is part of their culture and tradition. They follow simple hairstyles in the wedding. The prime focus of south Indian bridal hairstyles lies in the manner they are decorated. Flamboyant jewelry and beautiful flowers are used profligately to dress up the bride hair. Read More..
Making a bun is the most popular Hindu bridal hairstyles as it has an elegance of its own. In this particular hairstyle, the hair is collected together first and then circled around to give the shape of a bun. Depending on the length and volume of the hair, the bun can be of different kinds. It can be placed high or low depending on the look the bride wants to wear that mainly suits her attire. The high head bun is preferred the most. When it comes to Muslim bridal hairstyles, buns are preferred the most in case of hairstyle as it gives the most traditional look.Buns are highly popular in Muslim bridal hairstyles for a very long time. All the hair of the bride need to be back brushed and collected at one point and tied around to make a proper bun. It is very easy to make a nice bun on hair with good length. Read More..
Not everyone is blessed with sufficient amount of hair so that they can make any hairstyle they wish out of their hair. People with insufficient volume or whose hair is thin in nature need assistance of wigs, hair extensions or hair pieces to put together a gorgeous looking hairstyle. Indian remy hair which are used for Indian remy hairstyles are very popular for the above mentioned products. Read More.. There are several ways of making a bun as an Indian hairstyle for curly hairs. For that you need to first move your hair away from your face by tying it toward the back. The hair need to be back brushed for this. After holding the hair with a rubber band it needs to be parted in two parts. Both the parts need to be circled around the knot one after another and then fixed and decorated with pins to make it look good. Read More.. When it comes to hair, generally we spend our energy focusing on what should we do to add volume to our hair, or make them more lustrous or make them shinier. What we actually forget to do is avoid doing things which can spoil our hairstyle. Here are few t hairstyle do not tips.